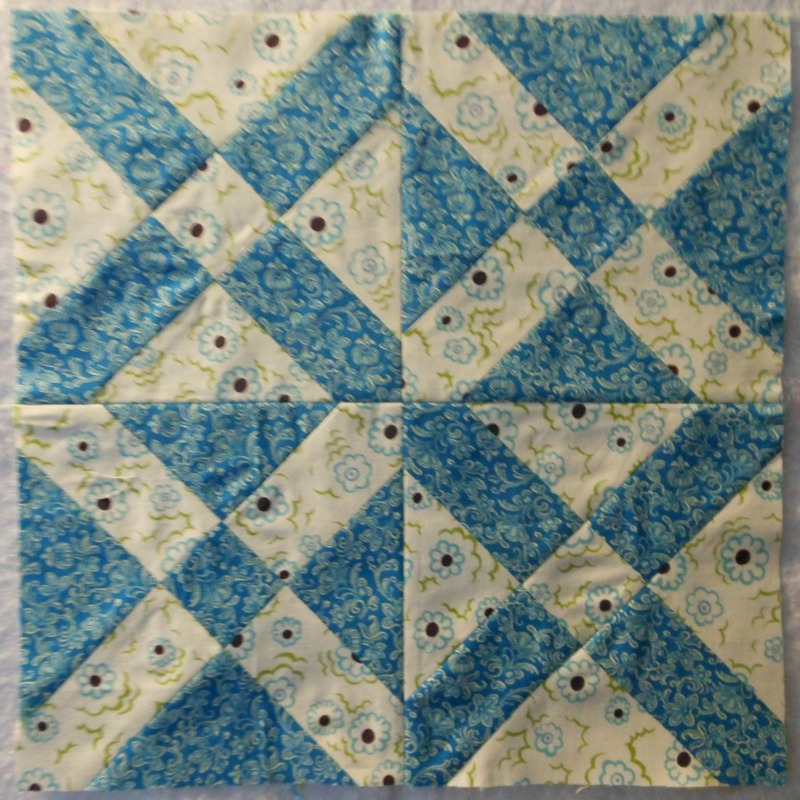 The Block of the Month for June at PQVA is my favorite kind: Quilter's Choice. The floral fabric was provided and the instructions were to make a 12 inch block with fabric and colors that play well with Blue. Since I have big plans to create a Wedding Quilt (mentioned in this post) using the Old Italian Block from Anita Grossman Soloman's book Rotary Cutting Revolution that requires 110 of them ... it seemed like a good choice to try out 4. Although the book includes instructions for using a paper piecing method, I'm going to opt out of that and hope for the best. It was kind of tricky with all those bias edges but I did survive. Anita give her tips on starching fabric- something I've never tried other than a quick spray of Sizing on occasion. The latest of my long list of blogs that I follow hers: Make It Simpler and I can tell already that I'll spend days catching up on the links and newsletters. 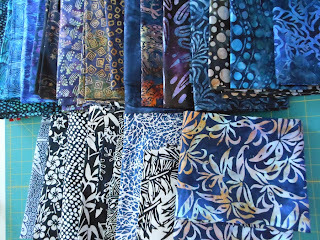 I'm using batiks in blue-ish for the dark and here's a stack of my first pull. The bottom row doesn't really read dark so they may or may not make the cut. Until I pull the rest of the lights I'll just leave them in the mix. The next big decision is whether or not to commit to an exclusively batik quilt or combine non-batiks like I did in the Lava Lamp quilt. The end result would be very different and I'm tempted to go that route but a bit nervous about the bias and varied tightness of the weave. 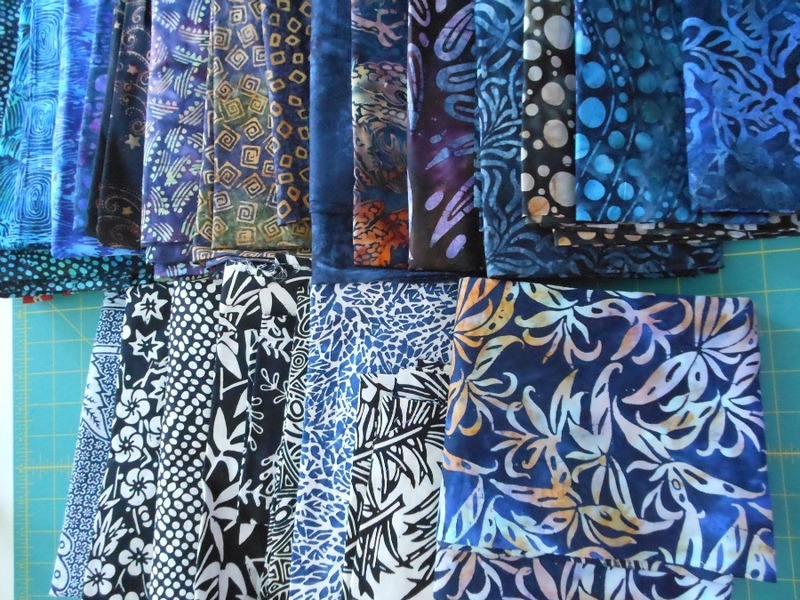 Do you mix batiks and quilt cotton often or have an opinion? Linking up to Modern Monday at Canoe Ridge Creations. Congratulations to all of the winners in the Ellison Lane Quilts Summer Sewing Contest posted here. This was a fun to participate in and a great way to start off the sunny weather inspiration and I really like those chosen.